the hunt for mushroom soup | escaped. Not sure if it's the hormones, but my digestive system seems to not prefer rice lately. Found myself drooling over breads and soups all the time; instead of the usual rice with chicken or beef dish! So when we were at IKEA last week to get some stuff for the house, I dragged the husband to Dome next door (The Curve), knowing they have any kind of mushroom soup and garlic bread I could satisfy my stomach. The order came, but I was disappointed. The (wild) mushroom was too dry and it was almost like they didn't use any cream or milk - it was so, so dry. The color was too dark and just not creamy enough. 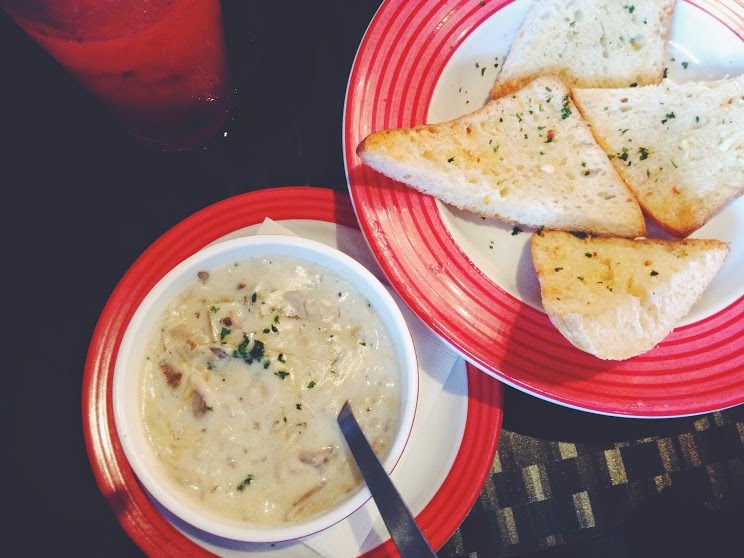 Fast forward yesterday, still on the hunt for my perfect mushroom soup, I remembered having dinner with a colleague a few months ago at TGIF - where I first discovered their signature creamy homemade mushroom soup with crispy garlic bread. So guess where we ended up yesterday haha. Finally settled my (latest) craving! This baby is demanding sheesh. "I want strawberry mocktail, please"
"Oh sorry, we are out of that"
"Oh no we're out of that either. In fact we don't serve *pointing at a long list of drinks* now"
It's a good thing I don't seem to crave for any kind of drinks; only food. "(pointing at a drink) does this drink mixed with soda?" Needed to find out if it's a carbonated drink, which I don't take. "Well I don't know..let me check"
And he had to check every time we asked him the same question for other drinks -_____-"
If it weren't for the mushroom soup and garlic bread, I wouldn't come back.